When you think of music and Las Vegas, four things should come to your mind; Barry Manilow, The Killers, Celine Dion and Panic at the Disco. Ok maybe those aren’t the first things you think of, but they very well should be. Amongst these legends, another is looking to break off the strip and into every bedroom in America, The Cab. Taking pop vocal influences and blending them with rock through the decades, The Cab has already established their hit capability and now look to continue their rise to the top. The album, titled “Whisper War,” also features both Patrick and Brandon Urie on the track “One of Those Nights,” the second single from the album. “Brendan happened to do a favor for us, they discovered us and what Brendan did (on the song) was sing on the record for us, his part was written.” Hearing the collaborative vocals between Stump and Urie is something that I have always enjoyed (sang together on “20 Dollar Nose Bleed,” from Folie a Deux). I found it interesting to note the bands influences. Cash told me that each member is influenced by other artists that have strong suites within the instrument. 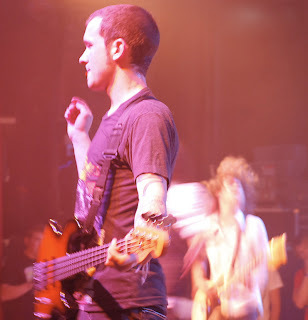 Alex Johnson, the bands drummer is inspired by drum rich bands such as Rush and Blink 182 while vocalist Alex DeLeon (note that the band has 3 Alex’s) is influenced by artists such as *NSYNC, and Rihanna.